Blindfold activities have been an important part of team building activities because of a number of reasons. Blindfolds help team members to work more closely and develop a sense of trust and coordination. During the blindfold activity, the individuals enter the condition of meditative to be able to see with eyes closed. If you are wondering what the benefits of Blindfold Activity are, go for the reasons mentioned below. Opening locks- One of the most common blindfolding activity is, opening locks. Before the start of the activity, the children are allowed to explore the lock. After a while, blindfold the child so that he can attempt to find the key and open the lock without using their sense of sight. Tower Building- Building a tower is another common blindfolding activity. In this activity, children are given some wooden cubes or small cubes and they have to build a tower using the blocks wearing a blindfold. Drawing and writing- Drawing and writing while being blindfolded makes a great combination. Give children some pieces of paper and dry erase board and ask them to write their names or draw something while blindfolded. It makes a great activity for small groups. Food tasting– Food tasting is another great blindfold activity. In this activity, the children are asked to taste some foods and drinks and guess what they taste. Food tasting is also a great game for Christmas, Thanksgiving and Halloween. Guess What– As the name suggests, this activity includes guess the item. The blindfolded candidates will be given several objects and they have to guess what the object is. 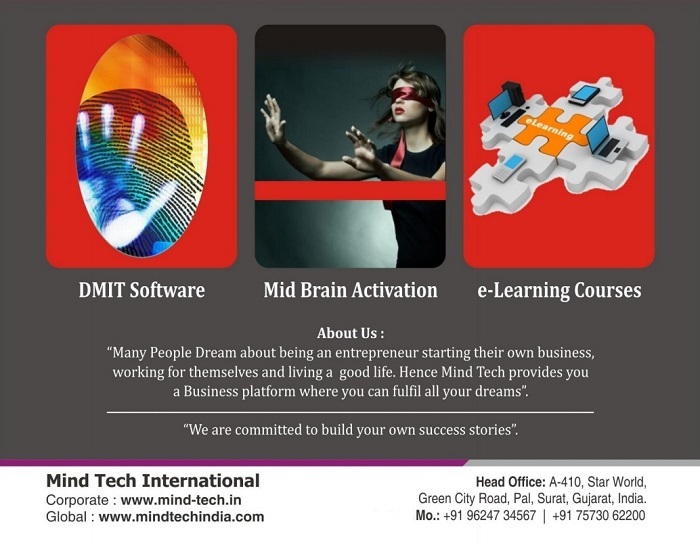 If you want to sharpen the skills and memory of the individuals, get in touch with the experts at MindTech. They are a dynamic team of professionals spreading Dermatoglyphics Multiple Intelligence Test & Mid Brain Activation concept in India. Visit the website today for more information.